Aloe brevisrostrus is easily identified from its counterparts by its clustered growth form and the broad thick leaves. The specie name 'brevirostrus' means short leaves and it obviously refers the the thick broad leaves that is a distinguishing characteristic of this specie. Aloe brevifolia var. depressa is the largest with rosettes that can be 300mm in diameter and leaves up to 150mm in height and 60mm wide. Aloe brevifolia var. postgenita is the intermediate form and Aloe brevifolia is the common specie that is commonly found in cultivation. Common Names: Duine-aalwyn (Dune Aloe) and Kleinaalwyn (Small Aloe), Short Leaf Aloe. Status: Not threatened but some localised forms may become extinct due to agricultural development and collection by unscrupulous collectors. Western Cape of South Africa, from Caledon and Bredarsdorp in the west to Swellendam and Cape Agulhas in the east. Aloe brevifolia occurs in a high rainfall area (400mm) and grows in clay soil in rocky terrain. Stem: Densely leaved rosettes, between 80mm and 300mm in diameter, are formed. Stems are short. Leaves: Leaves triangular and broad, 60mm in length and 20mm wide, greyish-green in colour. Upper leaf surface is smooth but the lower leaf surface a few soft spines are present near the terminal parts of the leaf. Leaf margins are armed with white teeth that are usually 3mm in length. Inflorescence: Simple inflorescence, between 400mm and 600mm in height, large papery bract present on the peduncle, racemes are cone-shaped, buds are hiddn by bracts. Flower: Flowers are a reddish colour, occasionally yellow. Tubular in shape and up to 40mm long and slightly curved, stamens protrude slightly from the mouth. Fruit can be found on raceme while flowering. Flowering Time: Flowering occurs in October and November. Light: Looks best when grown in full sun. Watering: Careful watering required in winter months. Frost Protection: Protection against severe frost required. Does well in rockery and container cultivation. 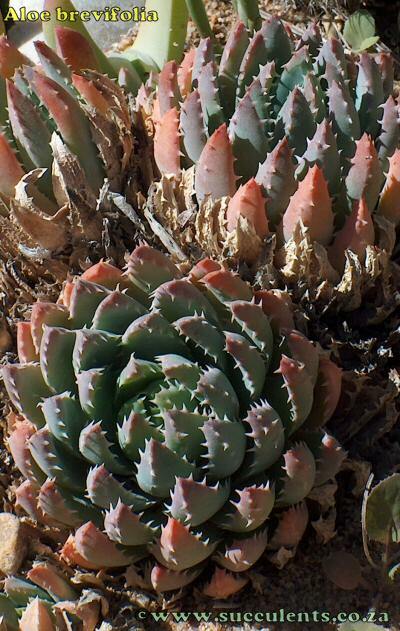 Aloe brevifolia forms many offsets and one can easily remove these offsets that can be placed in pots and rockeries. 1 Part well sieved compost. 2 parts washed sand (from the garden). Reference: Guide to Aloes of Southern Africa .